My latest Tableau project involves Canadian population demographics. 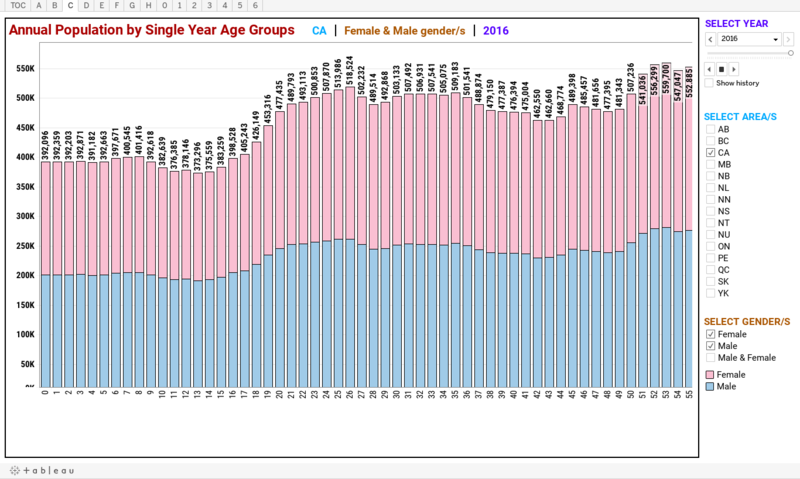 Statistics Canada has estimates publicly available with many age groups, both traditional genders, and all the provinces and territories, for each year from 1971 to 2016. It's a lot of data which is not only cumbersome to manage and use, but hard to visualize without a lot of work. Well, Tableau enabled me to change that so here are some of the initial offerings. I will write more as I create more interfaces with different ways to organize and/or access the data. 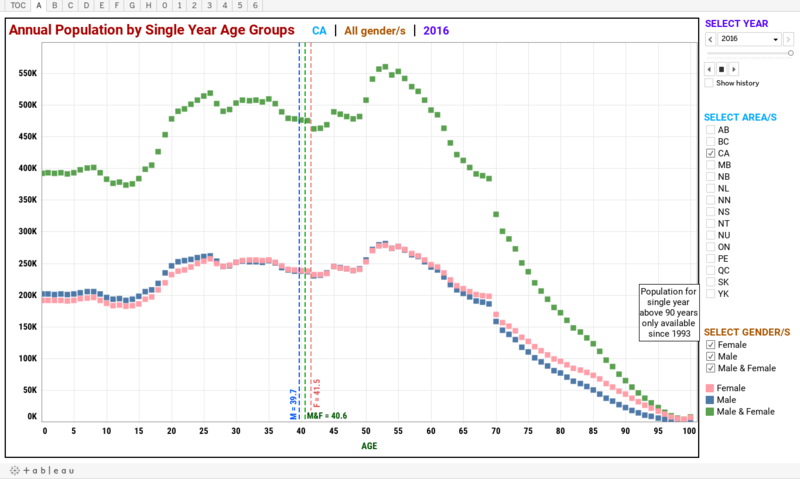 First up is your common scatterplot by single age years. The default view is for all of Canada, both genders. 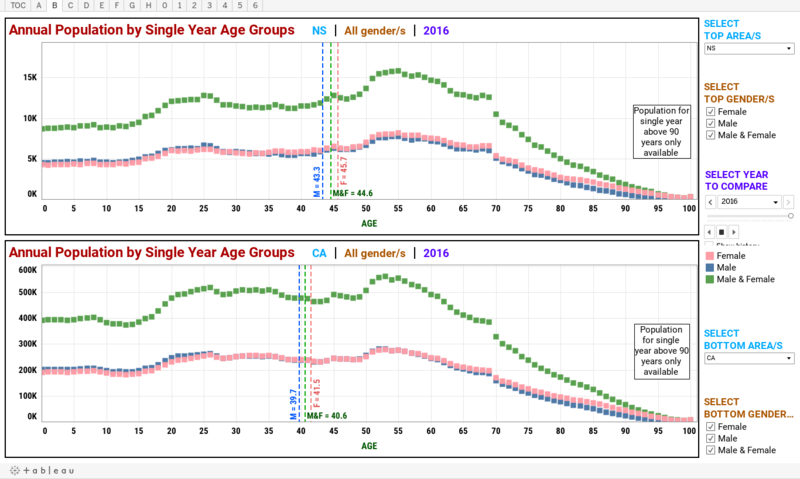 You can see the bump that is the baby boom now in their mid-50s to late 60s, hitting 70. That break in the smooth curve at 70 was 1946, after all the soldiers returned home and people started having babies again. The war ended in late 1945 so give 9 months for birth and you got the boom in 1946 that is a massive jump from 1945. If you slide that slider at the top right all the way back to 1971 and click through the arrow buttons to advance the years, you can see the baby boomers aging with time from that bump and gap moving to the right with older age. 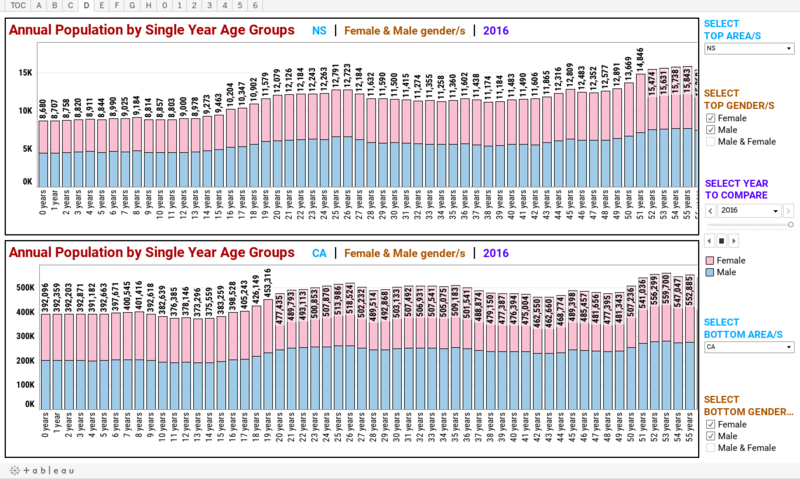 Those dotted lines for median ages of genders should confirm the aging as well. You can do this for all the provinces, or any groups of provinces, and see it to be true. The territories don't have the typical profile of people of Western society, with a greater share of First Nations people who lead a different lifestyle, so their population profile change isn't quite the same, but there's still a lot of similarities. Otherwise, you can see the typical trend in a slightly greater share of males till about 25 when stupidity to remove themselves from the evolutionary progression, and other factors that keeps the male life expectancy shorter than the females', reduces their share of the population to be less than that of females. Also true for the provinces and less for the territories due to the same reasons above. And with all the dots, hover your mouse cursor over them to see the population number, with note on which age and gender to be clear among the clutter of graphed points. But that's just one jurisdiction and demographic at a time you're viewing. I also built one for two jurisdictions and/or demographics to compare, on a common time scale that you change to animate through the years. You can really compare visually here as you don't have to remember what another profile looked like. A little detail is sacrificed, but not enough to make the graphs useless. But what you get in return is definitely worthwhile. If you prefer bar charts to see how much of the entire population males and females make up, there is this bar graph. You can move this graph with time, and also change other variables. And for a comparative look, there is a two graph version of the above, like with the scatterplot above. You can also change time on this graph, along with other variables. Next time, I'll talk about the trends for average populations, and how single demographics have changed with time. There, different generations pass through a single age or age range, rather than following groups of people (as generations) as they age.